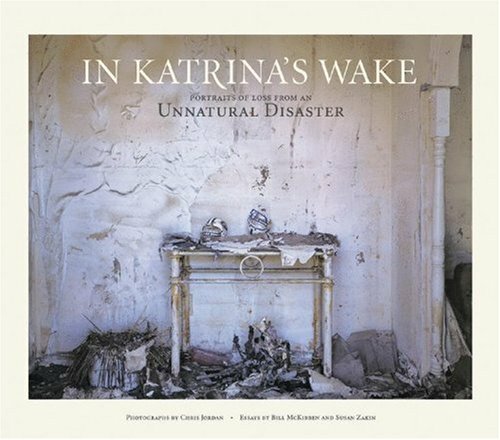 While many may argue whether the devastation of hurricane Katrina was the direct or indirect result of global warming, infrastructural neglect, inadequate preparation, or an incompetent governmental response, nobody will deny the heartbreak it wrought, the homes, businesses, and history washed away, the landscape uprooted, or the lives lost. Renowned photographer Chris Jordan went on assignment—his own—to capture the tragedy of the aftermath of this, the greatest natural disaster in the history of the United States. In Katrina's Wake, his series of 50 photographs, layer, the horror of ruin with the uncanny beauty of nature, even in its most savage incarnation. His images show how the remnants of a place—from Mardi Gras beads to church pews, from computer stations to swing sets—recall the essence of a place.